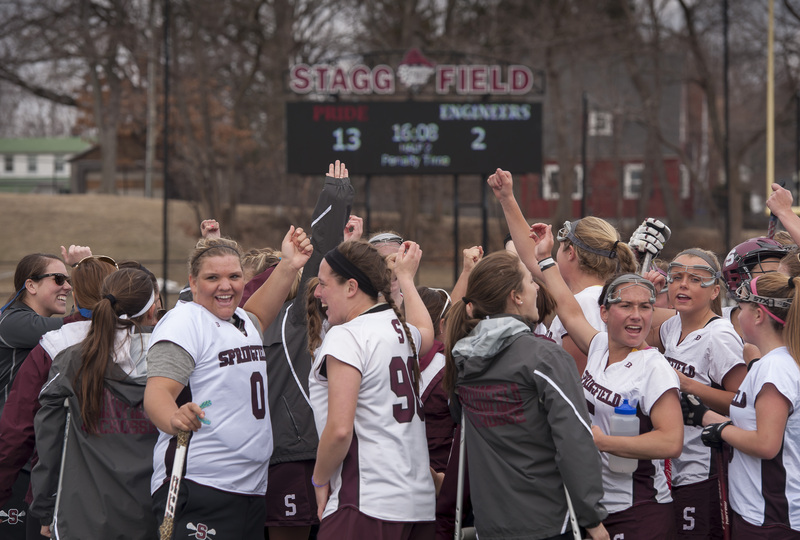 For head coach Kristen Mullady and the Springfield College women’s lacrosse program, it has been much of the same story. Springfield came into this season having lost just 22 percent of its offensive production from last season, including 51 out of 233 total points. Senior goalkeeper Anne Versprille was coming off of a dominant junior season, in which she posted an 11-8 overall record, including only allowing 7.87 goals per game and posting a save percentage of .498 on 349 total shots. All signs were pointed in the right direction for the 2014 squad, and the Pride have lived up to their expectations. To most outsiders looking in, the Pride’s 8-8 record is nothing to write home about. Their 3-6 out-of-conference record looks even worse, but what people don’t realize is that the Pride have upped their strength of schedule this season, in turn getting a little more recognition from the national rankings as well as becoming “battle-tested” for their conference play. Of the Pride’s nine out-of-conference match-ups, it has suffered six losses. Four of those losses have come from four top-10 opponents, according to the latest Intercollegiate Women’s Lacrosse Coaches Association national rankings. Of the four losses, the goal differential has only been a total of 17 points. The losses included an 8-4 battle with No. 9 Williams College, a 10-9 loss in double overtime to No. 10 SUNY Geneseo during the team’s spring break trip to Florida, a 10-4 loss to No. 5 Trinity College and, most recently, an 8-2 loss to No. 3 Amherst College, whose stout defense ranked No. 2 in the nation in goals allowed per game and only gave up an average of 5.46 strikes per contest. With a regular-season-ending 12-5 victory over Wellesley College this past Saturday, the Pride will head into the NEWMAC Championship tournament as the No. 2 seed behind Wheaton College. On April 15, the Pride had a chance to push the host site of the tournament into a three-way tie between Springfield, Wheaton and Babson, but when Babson was upset by Wellesley, the host and the regular-season NEWMAC title came down to the match-up between Springfield and Wheaton. Despite a four-point contribution from senior Kelly Gallo, the Pride fell to the Lyons 11-9, therefore losing the NEWMAC regular-season title. The good news for the Pride, however, is that the team is no stranger to playing the conference championship tournament in Norton, Mass. Just one year ago, Springfield cruised to their second NEWMAC championship in as many years after defeating Babson College, 7-2 behind a game-high three goals from Michelle Dorsey. Connie Nielsen, in her second year in maroon and white, impressed the NEWMAC last year with her 42 points as a freshman. In 2014, Nielsen has taken a bigger role within the offense, running the show from up top and creating opportunities for other members of the team. A product of lacrosse hot-bed Sayville, N.Y., Nielsen has posted 44 points in her sophomore season and is looking to lead the Pride to their third-straight NEWMAC championship. The three senior captains of the Pride, Kelly Gallo, Emily Fowler and Anne Versprille, have been the heartbeat of the team this season. Whether it is the 56 points tallied by Gallo, the nine-point performance from Fowler in a 21-15 victory over Mt. Holyoke, or the incredible conference-leading 8.22 goals against average that Versprille hoists, the trio has been leading by example. With one last shot at a run in the NCAA Tournament, the three seniors know that it is all on the line in the conference tournament. The Pride will square off with Babson on Saturday, April 26 to attempt to avenge a 16-12 loss earlier this season. The game is set to begin at 3 p.m in Norton.